“O” and Buckeye are two effective Zone Offense Set Plays to run. “O” is more of a continuity offense while Buckeye is a quick hitter. “O” is an offense that I ran with my MOKAN 16 U Select team this past spring/summer. “O” is also the Zone Offense the Oregon Ducks use. The only difference is, I have the opposite Short Corner flash to the High Post on the Throw Back Action. “O” starts with the 1 passing it to either wing. Whichever wing catches the ball is the player that is cutting to the High Post and is involved in the Throw Back Action. The first of the Zone Offense Set Plays starts with 1 passing the ball to 3. 3 immediately passes the ball back to 1 and sprints to the High Post. 1’s first look is 3 at the High Post. 1 then reverses the ball to 2. 2’s first look is the High Post. IF 2 can’t hit 3, 2 will attack the Top of the Key. 1 will sprint to the Left Wing and 3 will fill out to the Right Wing. 2 MUST HIT 3. The bottom/outside man of the zone must come up and take 3. Once 3 catches the ball, the Opposite Short Corner sprints to the Top of the Key. 3 is now reading the middles man of the zone. IF X5 moves toward the Ball Side Short Corner, the top of the key will be open. IF X5 goes with the player cutting to the High Post, Ball Side Short Corner will be WIDE OPEN. You will get open looks in the offense and you will cause your opponent to get out of zone quick. Buckeye is one of the Zone Offense Set Plays that I collected from watching Ohio State play against Syracuse in the 2012 Elite Eight! The play starts with the 1 and 2 up top. 3, 4, and 5 will start along the baseline. The play starts with 5 (Sullinger) coming up and setting a Ball Screen for 1. 3 who is starting in the Right Corner will sprint to the left corner. 5 will roll back to the block. 1 will attack the middle and kick it out to 2. As soon as 2 catches the ball, 2 will hit 3 and will sprint to the Right Side corner. 3 will dribble up causing the Top/Outside man in the zone to have to take the ball. The 4 (Thomas) will sprint right behind 2 and will Ball Screen for 3. 4 will roll all the way to the Right Side Short Corner. 3 will attack the middle and will hit 1. 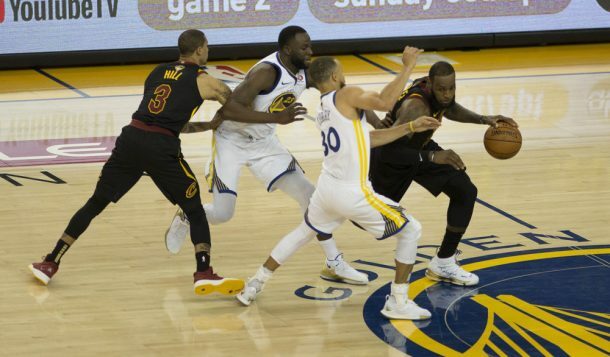 Once 1 catches the ball, 5 will sprint to set a Flat Ball Screen for 1. 1 will attack the paint. 1 will read the defense. IF X3 cuts off 1, 1 will hit 2 for a shot. IF X5 stays back in the paint, 1 will attack the rim. IF X5 comes off to contain 1, 1 will hit 4 in the Short Corner. Once 1 hits 4, 5 will dive to the front of the rim. 4 is looking to hit 5. Ohio State was very effective against Syracuse running this play. I LOVE this play because the ball is moved Side/Top/Side and the ball goes to the Short Corner. 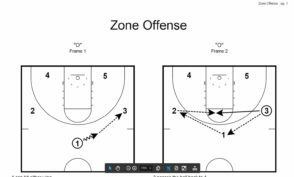 Both Zone Offense Set Plays are VERY effective. I would love to hear your feedback.